The most recent economic results in Morocco show a deceleration from last year. The north African country grew by 2.4% in the second quarter of 2018, down from 4.5% in the same period last year, according to the High Commission for Planning. The agriculture sector has been cited as the main reason for the decline; its output slowed from just over 18% last year to around 3%. Oxford Business Group published this article dated October 29th, 2018, written by Jaime Perez-Seoane de Zunzunegui, Regional Editor for North Africa and The Americas. How can Morocco revert its recent economic slowdown? The bigger picture looks fairly stable, though. The central bank expects the country to end 2018 with growth of 3.5%, a substantial figure despite having registered 4.1% in 2017. Figures remain strong enough to keep up optimism, as indicated by the local business community in Oxford Business Group’s latest Business Barometer: Morocco CEO Survey. Of the 106 CEOs surveyed between November 2017 and September 2018, almost three-quarters say they have positive or very positive expectations of local business conditions in the coming 12 months. This sentiment is further strengthened by the number of business leaders indicating the likelihood of future investments: 77% say it is likely or very likely that their company will make a significant capital investment within the next 12 months. Of course, challenges to economic expansion remain. In fact, they are inevitable when a country is working to maintain considerable growth levels. There are a number of responses to the question of Morocco’s economic slowdown. Undoubtedly, diversification of productive sectors and partnering markets will be key, and government efforts to transform Morocco into a regional hub have long been under way. In order to consolidate its position as a regional power, one area Morocco could enhance is its tax environment. With individual income tax capped at 38% and corporate tax at a maximum of 31%, coupled with a relatively complex local and national tax system, Morocco ranks 109th out of 137 countries in the total tax rate competitiveness category of the World Economic Forum’s Global Competitiveness Index 2017-18. Accordingly, 55% of survey respondents say that Morocco’s current tax environment (business and personal) is uncompetitive or very uncompetitive on a global scale. In addition, access to credit remains challenging, at least for some companies. While 40% of business leaders characterise the ease of access to credit as easy or very easy, 38% find it difficult or very difficult. Opinions on financing are always difficult to capture in surveys, as each firm’s profile – including its size, expertise, access to market and needs – influences its response. Nevertheless, we’ve seen increased efforts to make access to credit easier through non-traditional channels. For example, the country is in the process of approving a draft bill setting out the regulation of crowdfunding for both prospective investors and businesses, which is expected to provide a new source of funding to entrepreneurs, startups and other small businesses, many of which struggle to qualify for capital through traditional methods. A third challenge worth mentioning – and one that is largely acknowledged by CEOs in our survey – is the lack of leadership. Leadership is identified by 47% of respondents as the type of skill in greatest need in Morocco. I’ve met with many business leaders during my visits to the country, and the absence of soft skills among the country’s institutions seems to be affecting the public and private sectors; nobody knows that better than the men and women running companies on a daily basis. 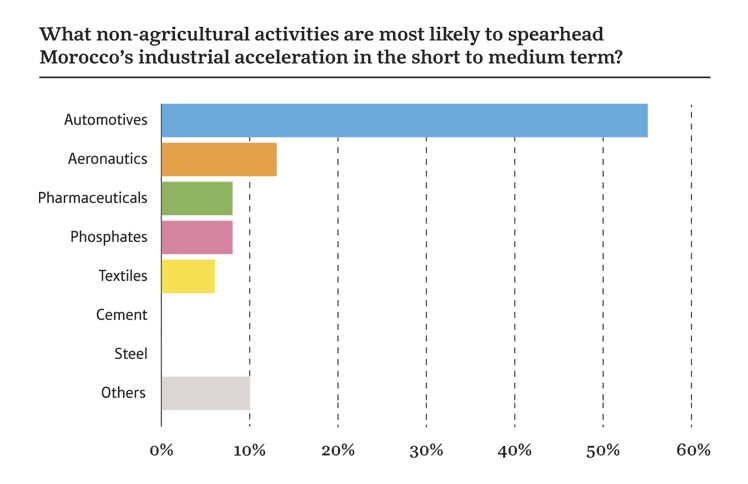 Despite the obstacles in the local business environment, CEOs are optimistic about the country’s dynamic local industry, with 55% citing automotives as the activity that is most likely to spearhead Morocco’s industrial acceleration in the short to medium term. In 2017 Morocco surpassed South Africa to become the continent’s leader in terms of vehicle production volumes, according to international media. Estimates for 2019 forecast Morocco will grow less than in 2018, which is a reasonable prediction given the country’s recent performance. However, if trade with old and new partners continues to develop, opportunities are expected to be generated for local investors and companies. Determination from Morocco’s business leaders is there, and the challenges have been identified, which is an important first step to tackling them.